WAIPA IN REAL LIFE: SNOWING IN HAWAI'I!!!! 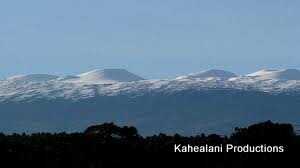 The first real snowfall in perhaps two years has capped the summits of Mauna Kea and Mauna Loa. 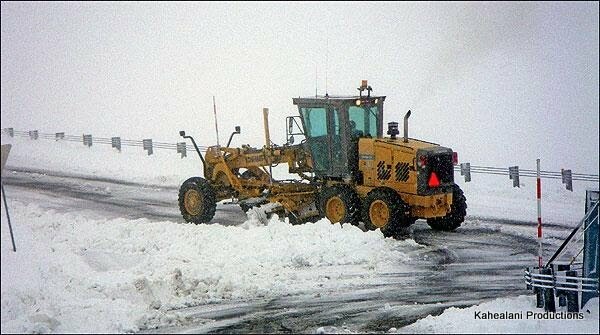 Mauna Kea's summit is closed at least through this morning and possibly all day as crews work to remove ice and snow from the access road following Friday's storm. Mauna Kea Weather Center forecasters expected fog, ice, thick clouds and snow flurries to shroud the summit through the night, with temperatures falling to 26 degrees Fahrenheit. "Periodic fog, ice and high humidity will probably continue to plague the summit through Monday night," forecasters said. 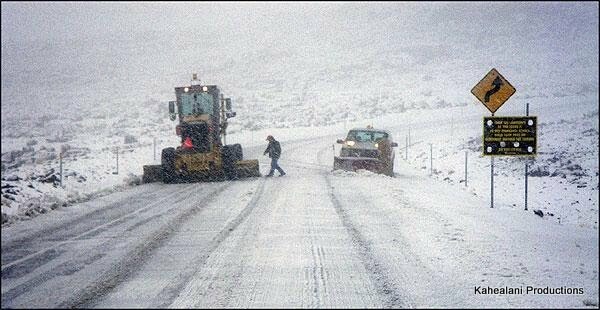 "The Mauna Kea Access Road to the summit is closed above the Visitor Information Station due to snow and ice on the summit roads, thick fog and deteriorating weather conditions," rangers said in a message posted Friday afternoon. "The road will probably be closed (today)." Friday, webcams posted at the various observatories showed whiteout conditions blanketing the summit, with steady winds of 40 mph and subzero temperatures all day. Personnel at all the observatories left the summit Friday due to the unsafe weather conditions. The National Weather Service had declared a winter storm warning in effect for both summits through 6 a.m. today. Up to 6 inches of snow are expected to fall by the time the storm passes, although much of that will likely melt away before anybody is allowed on the summit. On Mauna Loa, heavy snow prompted concern for three overdue hikers, but emergency responders reported that they were able to reach their vehicles safely. Forecasters expect better weather to arrive soon, as the islands dry out today. Another front is coming down the island chain, but it is expected to dissipate before reaching the Big Island. Southeast winds are forecast to persist throughout the next week. THESE PICTURES WERE TAKEN ON 12-10-10 ON THE 'BIG ISLAND" OF HAWAI'I. I HAVE MET AND HEARD PEOPLE SAY THEY DIDN'T KNOW THAT IT SNOWS IN HAWAI'I. "SNOWBOARD IN THE MORNING & SURF IN THE AFTERNOON"
ALL ON THE SAME DAY!! !